Thanks to the weather and a few other factors it feels like it has been an age since I had a proper trip out to do some photography. 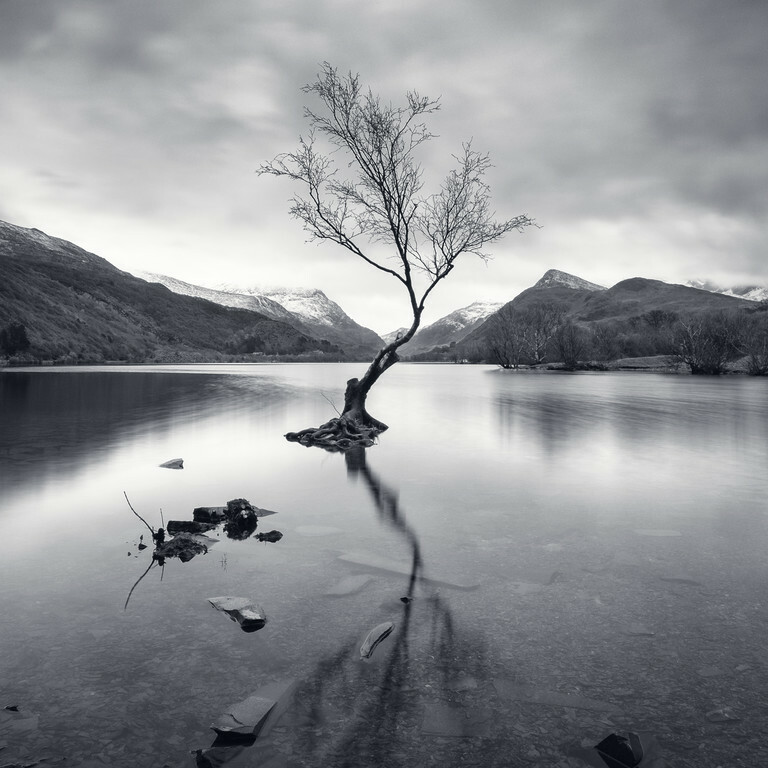 So this weekend just past I was determined to get out and decided to have another crack at the famous tree in Llyn Padarn, Llanberis. I’ve been a few times but conditions haven’t worked in my favour. On the journey over on Sunday morning there was a bit of promise as a hint of colour started to appear as the sun was thinking of rising. On getting to the spot I met a couple of other photographers and settled into place to see what the weather would bring. Unfortunately, just as the sun would have started to appear it clouded over and also the previously still lake was now showing a little movement from a slight breeze that had picked up. In truth, I was probably the happiest person there, the conditions becoming ideal for the type of black and white photograph I’d originally planned for on the first (and subsequent trips). Managing to blag a better spot, I decided on a square format and the composition above and then gave a couple of different exposures a try. Unfortunately, the clouds also then brought drizzle and a number of spoiled efforts but thankfully amongst the first couple of frames I’d bagged the shot I wanted and this is what you see above. This entry was posted in New Work on January 18, 2016 by anthony.